Limited Edition of 32 In her quaint workshop tucked in between the winding village streets of New York's Hudson River Valley, our milliner Carole designs each of our show-stopping hats. First, each base of navy sinamay straw is formed on a heated mold before being trimmed and hemmed. After cooling down, it is sent off to the decorating team where it is accented with a linen band, a bright burgundy silk tulip, and luscious silk leaves. 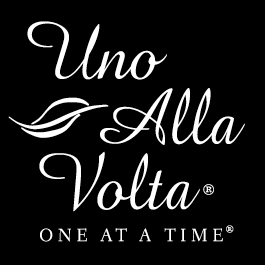 Handcrafted exclusively for Uno Alla Volta, from the hearts and hands of the artisans. Dimensions - Approximately 22.5 inch inner circumference.